FPSB’s global standards for the financial planning profession (as well as the global CERTIFIED FINANCIAL PLANNER requirements) are developed through an extensive, consultative process that involves FPSB’s Professional Standards Committee and its working groups, FPSB member organizations, academicians, certification specialists, CERTIFIED FINANCIAL PLANNER professionals, authors, consumer groups, the public and other key stakeholders from around the world. FPSB’s process is designed to gather input and feedback from stakeholders likely to be impacted by the professional standards (or certification requirements) to ensure that our global standards and requirements are rigorous, relevant and set at an appropriate level, and that they can be adapted for use in territories around the world. Through consultation with FPSB stakeholders, or based on a request from the FPSB network, FPSB’s Professional Standards Committee determines if FPSB needs to create a new Professional Standard or update an existing Professional Standard. FPSB’s Board of Directors reviews the Professional Standards Committee recommendation for a proposed new Standard or Standard revision, and authorizes the process to begin. 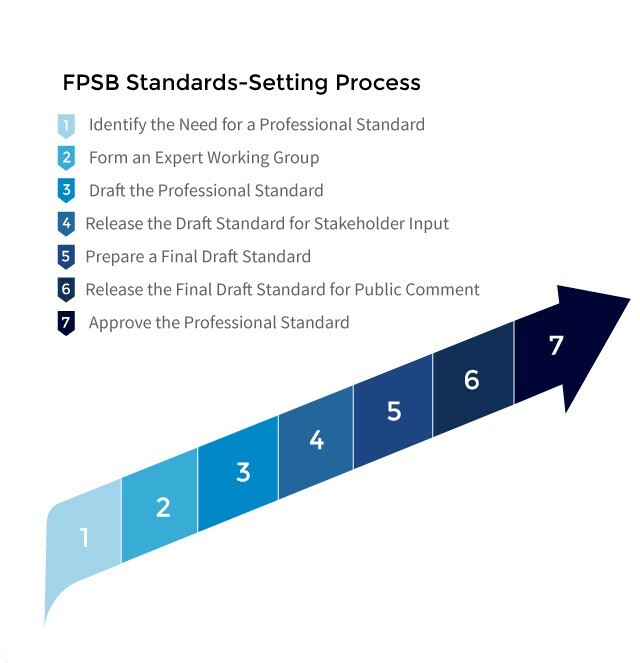 FPSB’s Professional Standards Committee forms a working group of subject matter experts and CERTIFIED FINANCIAL PLANNER professionals who collectively represent appropriate stakeholder interest in a revised or new standard. (Depending on the nature of the Professional Standard, the Professional Standards Committee may seek input from FPSB member organizations to frame technical issues prior to forming a working group to draft/refine the Professional Standard). The working group reviews the need for, and impact of, a new or updated Professional Standard, defines the scope and purpose of the Professional Standard and prepares a Draft Standard for consultation. Prior to issuing the Draft Standard for public comment, the working group shares the Draft Standard with FPSB’s Professional Standards Committee, FPSB member organizations, the FPSB Board of Directors (as appropriate) and subject matter experts to seek feedback and guidance on the Draft Standard. The working group submits the Draft Standard for approval by the FPSB Professional Standards Committee, which either returns the Draft Standard with comments to the working group, or recommends that the FPSB Board of Directors release the Draft Standard for public comment. Once approved by the FPSB Board of Directors, FPSB staff release the Draft Standard for stakeholder input, usually for a period of 30-60 days, depending on the nature and complexity of the Draft Standard. FPSB actively solicits input from FPSB stakeholders, in particular those representing the public interest and the interests of the professional financial planning community, on the content, applicability and implications of adopting the Draft Standard for the global financial planning profession. FPSB staff collates the feedback and guidance received from stakeholders, which it provides to the working group, which modifies the Draft Standard, as appropriate. The working group prepares a Final Draft Standard, which it shares with FPSB stakeholders for a final internal review (if needed) or with FPSB’s Professional Standards Committee, for recommendation that the FPSB Board of Directors approve the release of the Final Draft Standard for public comment. Once approved by the FPSB Board of Directors, FPSB staff releases the Final Draft Standard for public comment, usually for a period of 30 days. FPSB invites comment from FPSB stakeholders, in particular those representing the public interest and the interests of the professional financial planning community, on the Final Draft Standard. FPSB staff collates the comments received from stakeholders, which it provides to the FPSB Professional Standards Committee. Depending on the nature of the comments received, the Professional Standards Committee re-drafts components of the Professional Standard, sends the Professional Standard back to the working group for re-drafting, or recommends the FPSB Board of Directors approve the Professional Standard.